Rowan Glen’s Long-established position in Scotland’s Top 50 most loved brands can be credited to its consistently great tasting dairy products, its commitment to ongoing innovation and its ability to capitalise on emerging consumer trends. This has been demonstrated most recently through its response to the increasing consumer demand for products with added nutritional benefits. Perfecting its award-winning recipe for its Rowan Glen Low Fat Bio yogurt, each 125g pot of yogurt now contains 100% Vitamin D RI which, combined with calcium, promotes healthy teeth and bones. 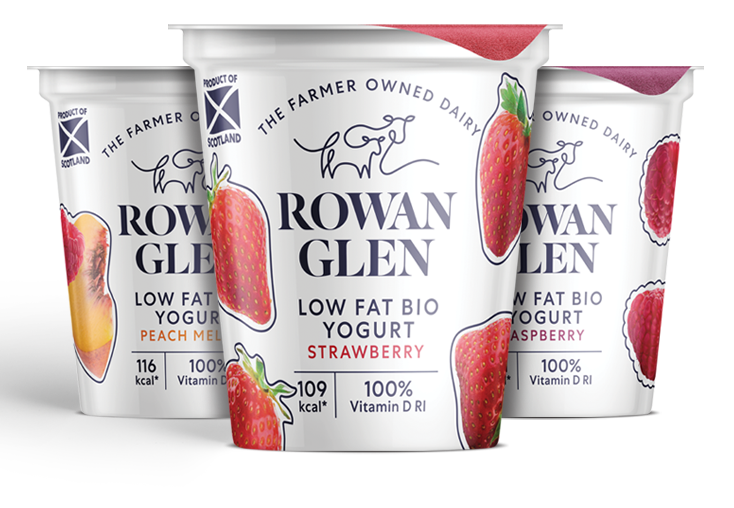 This, in addition to the extensive range of flavours including strawberry, toffee and peach melba, in single pots and multi-packs, makes Rowan Glen Low Fat Bio a firm and positive family favourite offering something for everyone. The Scottish dairy has also updated its iconic branding and packaging. The new logo is a acknowledgement of its pride in its farmer owners who are vital and trusted providers of the rich milk that goes into making the yogurts, while the new, distinctive white pots, featuring fruity flavours, now also very clearly advise consumers of the features and benefits of buying Rowan Glen. In addition, each flavour has a coloured lid, indicating flavour to ease navigation in-store and provide a stand-out presence in the chilled category. “In our dairy, nestled in the foothills of Galloway Forest Park, milk from our trusted farmer owned co-operative is transformed into a delicious yogurt with our signature Rowan Glen taste. We are a brand that consumers know and love, and we’re committed to delivering within on-trend and high-growth categories for our customers. “We are proud of our Scottish heritage, hard work and dedication required to create some of the world’s best dairy products. Our purpose-built centre of excellence in Scotland, enables us to meet customer demand and make a commitment to continuous innovation and optimisation of our products and packaging. 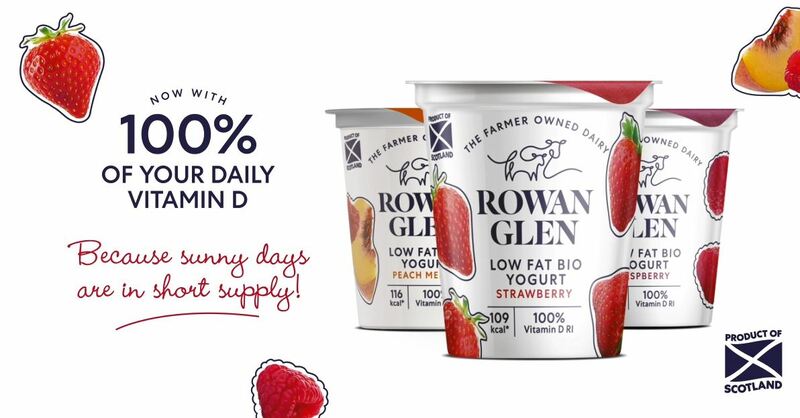 Rowan Glen has embarked on a significant marketing plan, led by OOH advertising and digital formats, with a focus on emphasising the fortification of the product with added Vitamin D. This will be supported by experiential in-store sampling as the company seeks to highlight the delicious taste, high quality and added nutritional value of its yogurts. “We are confident the new-look, impactful packaging, and our enhanced yogurt offering will resonate with consumers and drive uptake. Be it at breakfast, lunch or as a speedy snack, Rowan Glen dairy plays a key part in any eating occasion, which is why we continue to secure a prominent position in the chilled dairy food category,” finished Richard. Rowan Glen Low Fat Bio yogurts are available in seven flavours in 125g single pots in addition to 4 packs in strawberry, toffee, peach melba and assorted flavours.